Castle Mall01603 766430workGroup VisitsLocated next to Norwich Castle in the heart of the City centre, Castle Mall has five floors of great shopping, ample parking and an eight screen cinema. Find big name brands such as TK Maxx, New Look and Peacocks as well as La Senza, Boots and Argos. There is also a wide variety of independent stores such as The Tea Junction, Gifted and The Java Store. Children will be spoilt for choice with the Early Learning Centre, Mothercare and Hawkin’s Bazaar. For evening entertainment take the family to watch the latest film at Vue Cinema with free parking for up to 4 hours. Why not take a break from shopping and stop off in the Food Court, BB’s or Starbucks for a bite to eat or if you are in a hurry try some of the takeaway food outlets like Auntie Anne’s Pretzels or Subway. Services also include Bedlam’s Soft Play area for young children, Shop mobility, which hires out mobility vehicles, a Post Office and an NHS Walk-in-Centre. Castle Mall is open every day with late night shopping on a Thursday until 8pm and free parking after 5pm. Parking is easy with two car parks totalling 800 spaces, the main car park is located at the top of Rose lane and the second, smaller car park on Farmer’s Avenue. Park after 6pm any night (excluding Thursday) and pay £1.50 all evening allowing you to enjoy Norwich’s wonderful selection of restaurants and night life. Our main entrance on White Lion Street is a few minutes’ walk from the bus station and our Cattle Market entrance is only 15 minutes walk from the train station. Visit this vibrant shopping centre in the heart of Norwich. Located next to Norwich Castle in the heart of the City centre, Castle Mall has five floors of great shopping, ample parking and an eight screen cinema. Find big name brands such as TK Maxx, New Look and Peacocks as well as La Senza, Boots and Argos. There is also a wide variety of independent stores such as The Tea Junction, Gifted and The Java Store. Children will be spoilt for choice with the Early Learning Centre, Mothercare and Hawkin’s Bazaar. For evening entertainment take the family to watch the latest film at Vue Cinema with free parking for up to 4 hours. 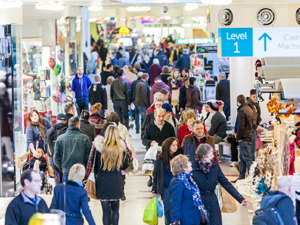 You will find everything you need for a great shopping experience at Castle Mall Norwich.